Built in battery and charger unit. Five foot electrical cord is stored in the Super Boom Box. 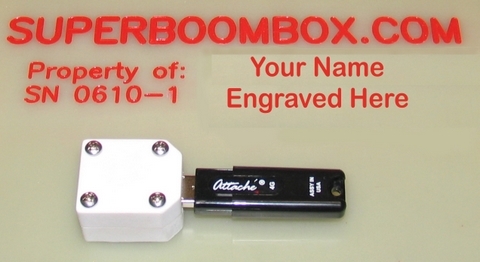 Super Boom Box will engrave your name in the boombox. This is where the USB Flash Drive memory stick is inserted. One 4 gigabyte USB Flash Drive memory stick holds enough songs to play over 65 hours of music. Over 1000 songs can be loaded on one 4GB USB Flash Drive memory stick, (based on an average of 4 minutes per song). Need more songs? No problem. Just plug in another USB Flash Drive Memory Stick. 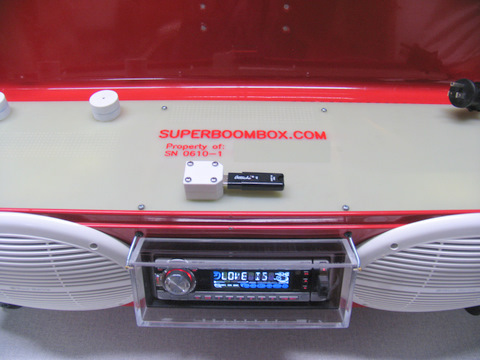 Super Boom Box outside photos. The best boom box for water aquatics, water aerobics, exercise workouts, parties, the beach, camping, DJs, workout instructors, and more. 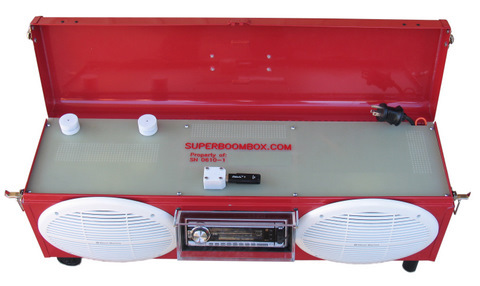 Order your Super Boom Box today.